High School: Sacred Heart Prep. 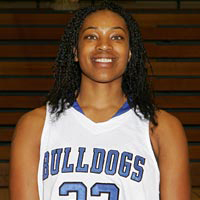 “NeNe” was second in scoring for the Bulldogs last season. She was also 3rd in conference in rebounding. She will be a force inside and outside this season. She is majoring in Psychology with a minor in Business. Her parents are Lisa and Joseph Smith. Her siblings are Demetra (30), Devonna (21), Joseph (19), Jason (17), and Diaya (12). She enjoys listening to music and hanging out with her friends. Her hope for the team is to go and win state. She hopes to earn a scholarship and continue playing basketball.